French Fries without all the calories, whoda thunk? 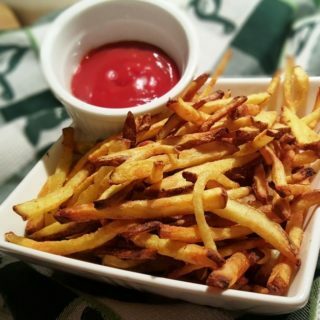 Homemade deep fried French Fries are so delicious, but come with so many bad calories. The oil needed for good French Fries is so bad for our bodies. Baked French Fries, while much less calories, aren’t really satisfying and have an odd texture, I think. You know what I mean? They are hard on the outside, rather than crispy and then soft inside. Hard to explain. Friday night is “Wing Night” in this house and we used to bake our Buffalo Chicken Wings and French Fries, but now, thanks to our Air Fryer, we can have Air Fryer French Fries without all the bad calories. Please feel free to join the chat at Facebook Air Fryer Recipe Group, where we share recipes, methods and fun. Coconut Oil is my oil of choice for French Fries, but Olive Oil works well too. I’ve been on a Ghee kick lately, so I think next Friday night, I will use my Homemade Ghee to make the Fries. Make sure that you mix up a big batch of my TOG House Seasoning Recipe, so that you always have it ready. Scrub the potatoes well and then slice them as evenly as you can. A good French Fry Cutter, really helps! We like our French Fries between thin and thick, almost twice the size of a Fast Food Fry, but about half the size of Steak Fries. Place them in a Bowl of water and allow them to soak for 30 minutes. This will remove some of the starch and allow the potatoes to cook better and crisp up better. 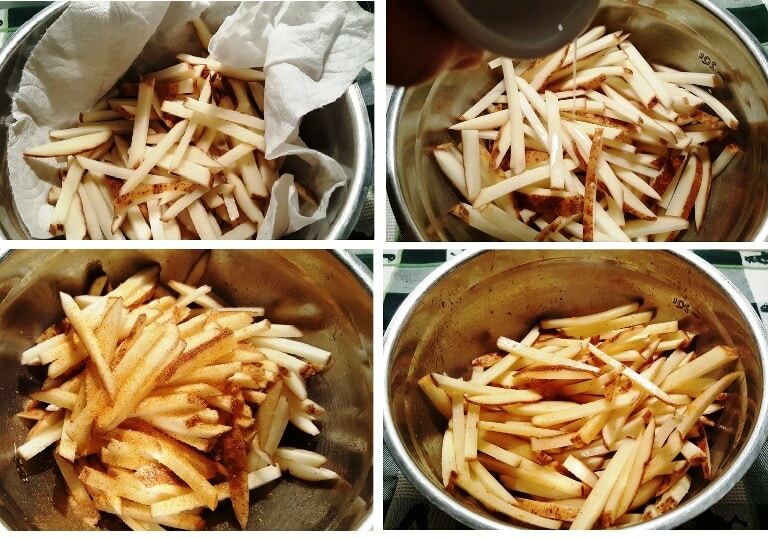 Pat dry the fries with a paper towel or tea towel and then pour over the oil and mix in. Sprinkle the Seasoned Salt and toss to coat. Place them in your Air Fryer and cook for about 15 minutes, tossing half-way through. Delicious fries that are not loaded down with oil. Now, you can have your cake and eat it too! 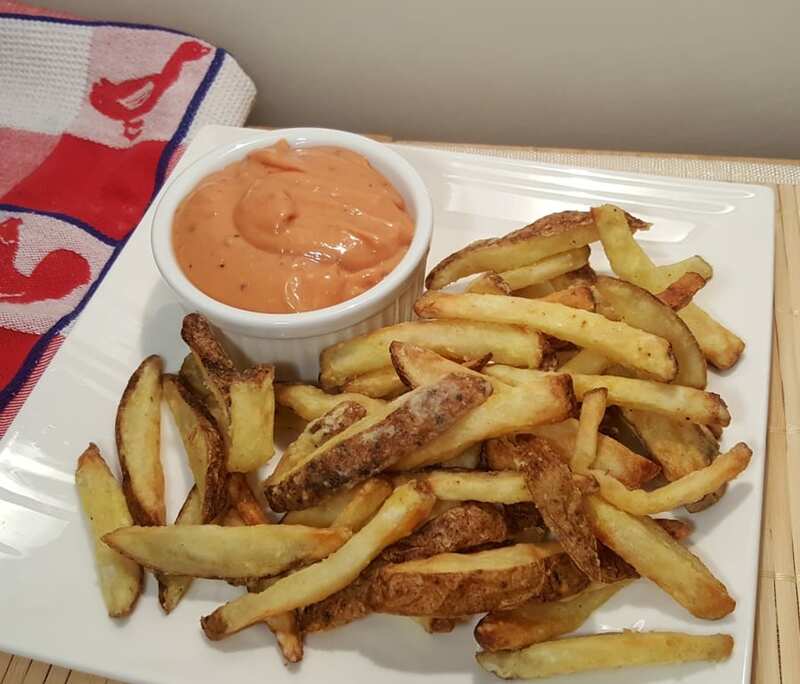 Try these Air Fryer Seasoned French Fries with some Zaxby’s Sauce for a real treat! For a lower calorie treat, try my Air Fryer Radishes! Scrub potatoes and then slice into strips. 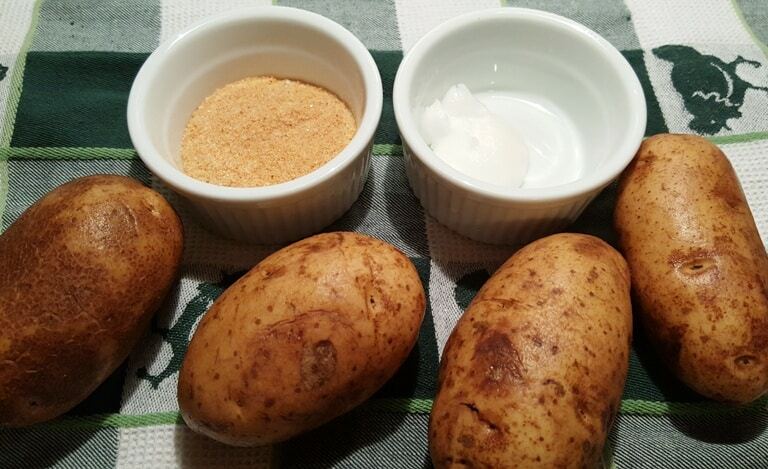 Soak potatoes in a bowl of fresh water for 30 minutes. Pour over coconut oil and mix through. Add seasoned salt and toss to coat. 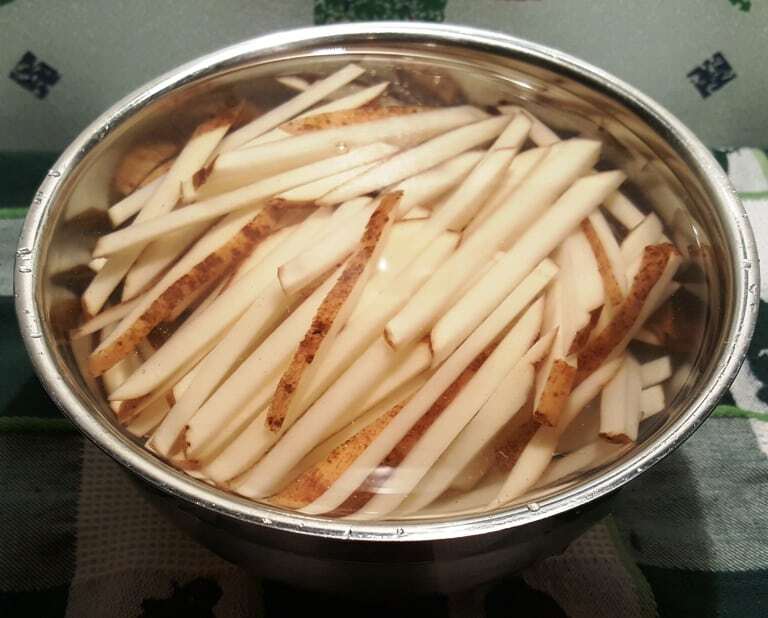 Place potatoes into Air Fryer Basket. Air Fry at 400 degrees for 15 minutes, shaking the basket half way through. 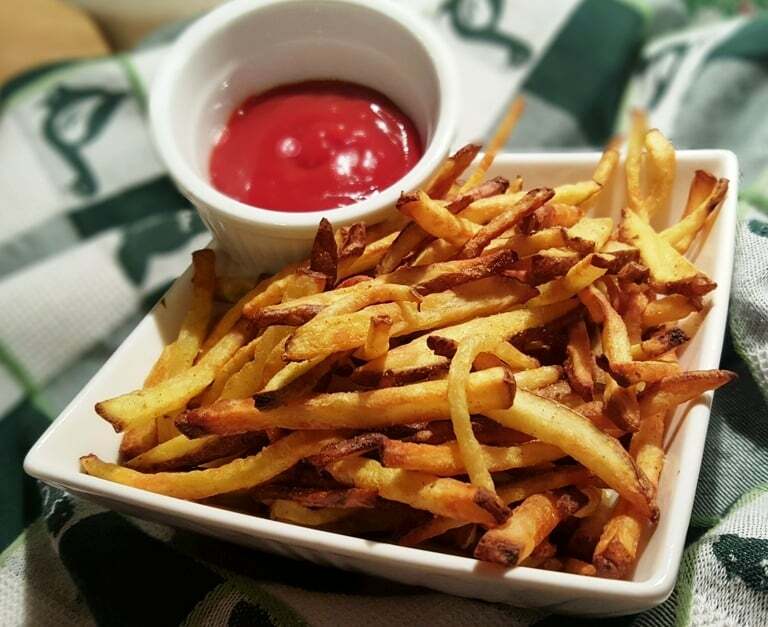 PIN this Simply Delicious Air Fryer French Fries! Previous Post: « Think Before You Click! Cooked 25 minutes at 400 and still not crispy. Don’t know about this air frying. I preheated my sir fryer at 400degrees for ten minutes, added my cut potatoes that I VERY lightly sprayed and tossed with olive oil. Set my fryer for thirty minutes. Half way through I opened it up and shook the fries really well around. Put it back in to finish the 15 minutes. They were outstanding!! ( I own an Emeril Lagasse hot air fryer ). Wonderful news. I am glad your fries were outstanding! Thanks for the comment. I have a EL airfryer as well – they are on the menu tonight!! could you share what air fryer you use? I keep seeing these articles claiming how much healthier air fry is supposed to be, but, no charts showing the actual calorie differences between ways of cooking. The wife bought a Farberware Air Fryer, the included recipe book has no mention of calories or nutrition values. I’m genuinely curious about this, so I did some math for us to look at. Quick Google search shows that a small order of fries at McDonald’s is 230 calories. These are the order of fries that aren’t even served in a carton, it’s the size in the paper sleeve. Their website also gave this helpful ingredient list for fries: Potatoes, Vegetable Oil (Canola Oil, Corn Oil, Soybean Oil, Hydrogenated Soybean Oil, Natural Beef Flavor [Wheat and Milk Derivatives]*), Dextrose, Sodium Acid Pyrophosphate (Maintain Color), Salt. *Natural beef flavor contains hydrolyzed wheat and hydrolyzed milk as starting ingredients. Wow! Ok, so just a recap of what we’re looking at here: small fries with a few ingredients that aren’t potatoes and oil. As for the air fryer, just going with the ingredients I use: 1 medium russet potato and 1 tablespoon of olive oil adds up to a ballparked 289 calories (potato-170 calories and 1 tablespoon olive oil- 120 calories). The exact value for the potato is estimated, but this was specifically for a potato 2-1/4″ to 3-1/4″ in diameter. For my air frying friends, I’m sure you know this potato will make way more thin-cut fries than a small order at Mcdonalds. So for a quick comparison, an order of small fries at McDonald’s would be 230 calories. A serving of air fryer fries would be about 289 calories. Yes, I calculated the air fryer fries to have more calories. 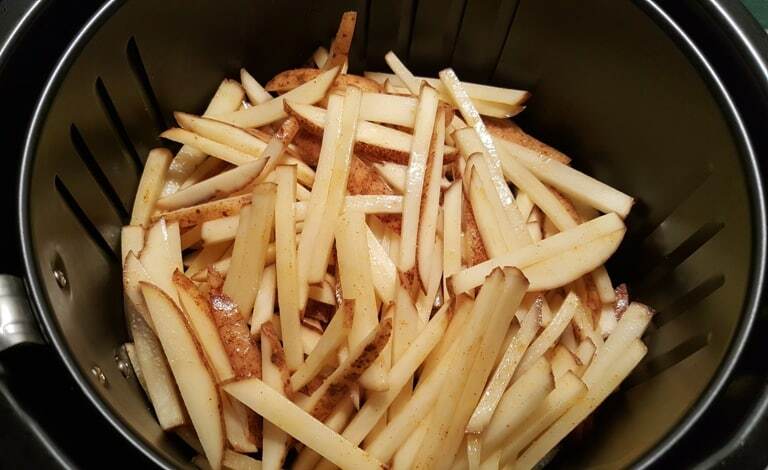 However, it’s important to remember how many more fries you’re getting from a single potato and the quality of the ingredients you choose to eat when you do use the air fryer. I would suggest comparing quantity in this case for simplicity, McDonalds will give you a small fistful of fries, while the one potato in the air fryer might yield double or more than this amount. Again, all of this is estimated so take from it what you will, but I argue that your wife know’s what’s up! 😉 Hope this was helpful. Thanks for the recipe. Turned out fantastic! I just cut back on the salt a bit .25 tablespoon. Mins . And rinse but the fries came out bitter. I was so disappointed . Plz advise how to get bitterness out of potatoes . I used russet potato. Do you have recipes for those of us on the Keto Diet? Air fryer. I will try it. The rotating basket is probably preventing the crisping you are looking for. My fryer has trays and I put the fries on in a single layer. That seems to work well. I cook one at a time, the fries first, then cook your meat. when thats done I throw the fries back in for a couple minutes they taste just like they were cooked. Was wondering there was a difference between air cooking products? Have a “Crofton” air cooker. Same as a frier??? Are these fries made from Yukon Gold potatoes? I believe just regular russet, I use the giant ones I get from sams club. I make these all the time but cutting them with a knife makes them inconsistent. anyone have a recommendation for a french fry cutter? You didn’t leave a temp…. My husband and I both liked these a lot. I followed your directions exactly. I love that you post pictures along the way so we can see what things are supposed to look like. I will definitely make them again. Thanks Jill. So delicious! Thank you! I used the fries with a creamy garlic sauce because I am a vegetarian so no worcestershire sauce for me. I didn’t have a potato cutter, but cut thin just like you did. I soaked them & patted them dry. Tossed with a little olive oil and seasoned them. They turned out really nice and crispy. They did take about 25 mins though. I’d make again.